Cleansing is a great tool to refresh digestion, purify thoughts and stay balanced. Cleansing can be slightly intimidating. To help bridge that gap, I’ve answered a bunch of your common questions about cleansing below. Can I do a juice cleanse if I don’t have a juicer? Heck YES you can! 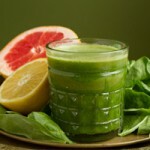 Check out this video from my friend Angela on how to make juice with your blender. If I’m allergic to apples, what would I replace them with? How should I expect to feel after the first day? Everyone is different and will have a different experience with cleansing. Personally, day 1 of my cleanses are usually filled with cravings and food stories that run in my head for hours on end. I like to ease my cravings by reading a book in the sunshine, going for a nice calm walk, or having a nap. As I mentioned before, it’s absolutely imperative that you check with your healthcare provider to be sure that cleansing and juicing is right for you. I don’t like to do hard workouts while I’m cleansing. Light stretches, light yoga, those sorts of things are usually fine. Listen to your body. Is it safe to cleanse when you’re pregnant? It’s best to chat with your healthcare provider on this one. Can I use beet greens in my juices? Heck YES you can! I didn’t use the greens for these recipes because it makes the color of the juices a bit funky and not so hot for the camera, but yes, add them in, especially if it’s a juice that has fruit (will make the greens not so bitter). Is it cheating if I add coconut milk, oil or another dairy-free milk to my juices for added nutrients? Blah, I hate the word cheating. This is your cleanse, your body, your experience. If you feel that it’s best to still have a bit of fat in your diet while you cleanse, go for it. Before you move forward, ask yourself – is this what my body wants? Sit with yourself for a moment and feel for the answer. Works every time! Is it normal to feel this hungry? Everyone’s experience is different with cleansing. Hunger is the strongest on day one and the beginning of day two but should subside at the end of day two and into day three. Please, listen to your body and check in often. If you’re not feeling well – dizzy, nauseous, faint… ask yourself if this is the best route for you. There is a thin line between what your body wants and what your mind is craving. Ask yourself if the food you’re craving or the feelings that you’re having are supplementing for an emotional block or attachment to an unhealthy pattern. Cleansing is the best time to go deep and ask yourself these types of questions. If you feel it would be best to stop cleansing, perhaps entertain the idea of having a couple of smoothies for the rest of the day to ease yourself back into solid food.